In order to spread the message of the Slow Cooker Challenge to as many Slow Cooker owners as possible, this month will have an 'OPEN' theme, so you can enter any dish cooked in an electric slow cooker. 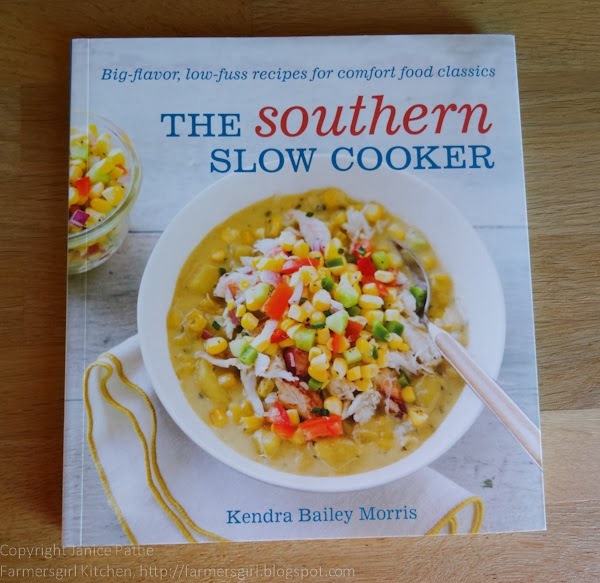 The Southern Slow Cooker is subtitled Big Flavor, low-fuss recipes for comfort food classics and I think that sums up the recipes and style of Kendra Bailey Morris in this book. The Southern in the title refers to the Deep South of the USA, and Southern Food is described in the book as "the welcome table, a convivial place where you can savour a hearty meal cooked with love and where there's always room for one more chair". Kendra Baily Morris is a cookbook author, food writer, recipe developer and television host. She served as a judge for the 2011 and 2013 James Beard Awards and has a masters degree in creative writing from Virginia Commonwealth University. Have a look at The Southern Slow Cooker blogspot for more information. Get a baking dish that fits inside your slow cooker - this enables you to make cakes and desserts without the mixture burning. Don't be afraid to season generously as slow cookers steam food for a long time, flavours can become diluted. Chapter One: Soul-Warming Soup, Stews and Chillis including Mom's Fully Loaded Potato and Onion Soup, South of the Mason-Dixon Manhattan Clam Chowder, Buffalo Stout Beer Chilli (see below), Chicken and Cornmeal Dumplings and Aunt Barbara's Stew. Chapter Two: Low and Slow Meats including Beer Braised Po' Boys, Meatloaf with Brown Sugar BBQ Sauce, Graham Cracker Stuffed Ham Steaks, Country-style Pork Ribs with Bourbon and Coke BBQ Sauce, Red Beans and Rice with Smoked Sausage and Dry Mustard-Rubbed Shredded Chicken. Chapter Three: Vegetables and Sides including Kale with Ham Hocks, Mom's Creamy Corn Pudding, Black-Eyed Peas and Stewed Tomatoes, Country Breakfast Apples, Cinnamon and Brown Sugar Oatmeal with Maple Candied Bacon and Country Ham and Egg Breakfast Bread. Chapter Four: Desserts and Sweets including Buttermilk Chocolate Spice Cake, Molasses Gingerbread, Gingersnap Peach Upside-Down Cake, Chocolate and Caramel Black Walnut Candies and Lemon Blueberry Buckle. Chapter Five: Southern Odds and Ends, Plus Non-Slow Cooker Essentials including Apple Butter, Caramel Sauce, Peach Mango Jam, Easy Chicken Broth and the inevitable Cornbread, not cooked in the Slow Cooker but a Southern essential. Who is it for? Anyone who has a Slow Cooker and would like to try making some dishes with a real taste of the South. There are some really appealing recipes in the book. The recipes are well laid out with an introduction to each recipe and recommendations for drinks, some recipes also have extra hints and tips. I loved the desserts chapter as slow cookers are not noted for use in making dessert, I haven't tried them yet but am hoping to in the near future. Regular readers know that I love photograph with each recipe. Unfortunately this isn't the case with this book, but the photos that are there are very good and very tempting. The recipes are written with US measurements which doesn't bother me as I can work with pounds, ounces and cups as well as metric measurements. I was, however, a little disappointed that there wasn't even a conversion chart at the end of the book. 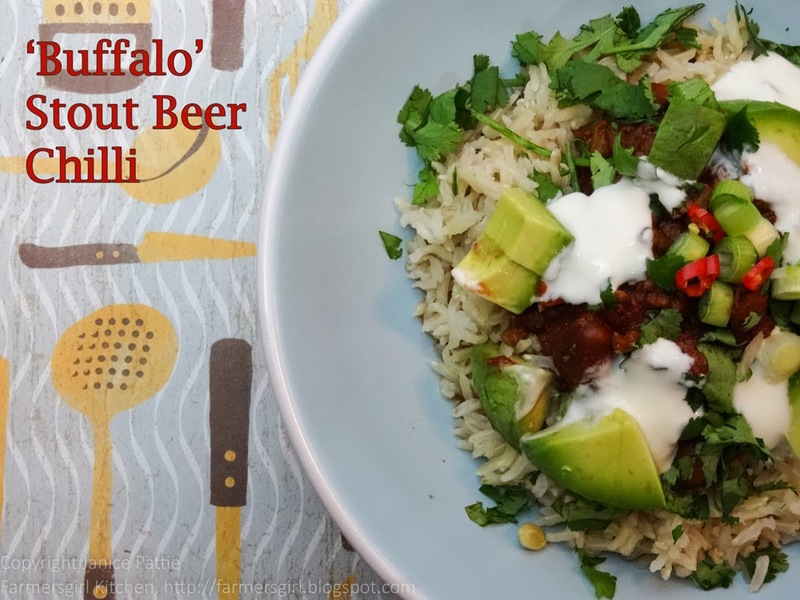 This was a delicious rich bowl of chilli, the stout gives a depth to the chilli which works really well and although there seem to be a lot of ingredients, the recipe was very simple to make and I had enough to freeze for another day. Do add the garnishes, they make it so much more fun to eat and the different flavours and textures finish the dish perfectly. If you use twitter, tweet your post with @FarmersgirlCook and #SlowCookerChallenge and I will re-tweet it to my followers AND post your post your pictures on a decicated Pinterest board. To enter the prize draw to win a copy of The Southern Slow Cooker by Kendra Bailey Morris please link up your Slow Cooker Recipe to the Linky and leave me a comment, telling me why you would like to win The Southern Slow Cooker (UK only). I like the sound of the chilli. Too bad, I don't have a slow cooker. Chilli looks fantastic! I'm the same as GG and Fiona, use my cast iron pot :) But I was always curious why it is so popular? Dom & Chris: you can pick up a slow cooker for very little or simply cook the recipe on a low heat in the oven. GG/Fiona: I used to use my Le Creuset but it's more economical to cook for a long time in a slow cooker than in the oven or on the hob. I didn't get on with my slow cooker in the 1980s, but love this Sear and Stew one. Ren: So it would for the six nations! Sylvia F: Thanks for the kind comment. Slow cookers are way more forgiving than cooking in your cast iron pot in the oven, you can leave it all day. Also more economical, less fuel to cook. Wish I had a slow cooker so I could join in. Unless an Aga counts? What a brilliant way to serve chilli. It looks so appetising. I'm going to do that next time I make chilli! I've no idea why exactly it's taken me so long but only this morning have I finally ordered my very first slow cooker!!! And can now join in with your lovely challenge, I'm obviously planning on quite a few slow cooker recipes so might just be inundating you! Mmmm, now that's my kind of food! I adore chilli with all the trimmings, I think that the toppings are as important as the chilli. I have a recipe for this month's challenge too! Vanesther - you could certainly cook the chilli in your aga but I'm afraid it wouldn't be eligible for the linky. Jac - I always think the bits and pieces are the best bit! 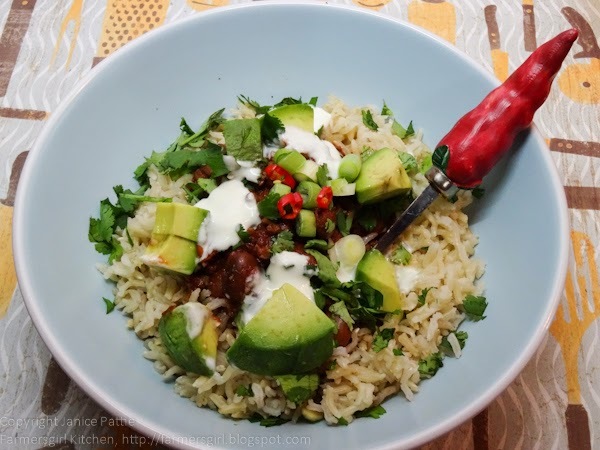 I could really do with tucking into a bowl of chilli right now. It looks delicious, especially all the toppings. Ooh desserts in a slow cooker? Look forward to you trying some of those out. You can never have enough cook books and perhaps a slow cooker one would make me be more inventive than 'chuck it all in'!